SERVICES PROVIDERS: Please send any corrections to your listing; other categories under which you should be listed. NEW ENTRIES: a less than 200 word description of your services (be sure to include the keywords that people will be searching for) AND any facilities located in, or readily accessed from, North Brevard; a maximum dimension 2"hx2"w logo or photo (I can reduce it); the link to your Facebook page (if). ANYONE: Please send information about a service for developmentally special needs people that is not here. Suggestions are welcome; the webmaster reserves the right of editing and final selecting. Agency for Persons with Disabilities (APD) is an agency separate from the Department of Children and Families, specifically tasked with serving the needs of Floridians with developmental disabilities. Among those served are people with: Autism, Cerebral palsy, Spina bifida, Intellectual disabilities, Down syndrome, Prader-Willi syndrome, & Children age 3-5 who are at a high risk of a developmental disability. Supports persons with developmental disabilities in living, learning and working, in all aspects of community life. The APD works in partnership with local communities and private providers to assist people who have developmental disabilities and their families. 400 West Robinson Street, Suite S430, Orlando, FL 32801. (321) 604-4273 • (407) 317-7000. The APD program can provide a Medicaid Waiver (Med Waiver) Support Coordinator (WSC) who can advise and coordinate the full range of services helpful to a person with special needs. The process by which someone gets access to a Waiver Support Coordinator (WSC) is as follows. Waiver Support Coordinators are not allowed to solicit a caseload. A disabled person must first become a client of APD (Agency for Persons with Disabilities). They then have to request to be put on the iBudget Home and Community-Based Waiver. If accepted for the Waiver, they are then given a "Choice Letter" with WSC's that have openings (they have a legal limit of 43 full cases with minors being considered "half cases"). The individual and their family interviews available WSC's then selects the one they like. Florida Medicaid Waiver Florida has several Medicaid waiver programs. Florida Identification Card designated with "D" for developmentally disabled. To have this designation put on the Florida Identification Card you must Complete an Application for Identification Card with Developmental Disability Designation Fee: $1.00. This will help police and others identify special needs. The Florida DD Waitlist Campaign is a program of the Florida Center for Inclusive Communities at USF. The Florida DD Waitlist Campaign aims to raise awareness of this issue to Florida legislators and the general public by using social media to advocate for increased funding to serve the individuals on the waiting list. Provides persons with disabilities innovative services and opportunities to achieve personal success. Provides comprehensive services to adults with physical and intellectual disabilities and homeless and/or disabled veterans. Services Offered: Group homes in Rockledge and Titusville • Supported Living • Employment Services (e.g. job matching, OJT, work assessments, Project Search, Discovery) • Community day habilitation programs • Patriot House Veterans Transition Program • Wounded Warrior Program • Community day habilitation programs • Material Recycling Facility serving, PAFB, KSC, CCAFB) • Bridges Electronic Recycling • 'Quick Prints' Electronic Background Screening Service • Bridges Foundation. East Coast Contract Industries, Inc.
Services for adults with disabilities to support skill development consistent with abilities and needs. Washington Square, Titusville, FL - Central Florida Communities, Inc.
An Intermediate Care Facility for the Developmentally Disabled that takes pride in providing the very best comprehensive care and services in a homelike setting. "Provides services to children and adults with skills enhancements consistent with abilities and needs." "Work Adjustment Training services available for people with disabilities." Contact Vocational Services Coordinator at (407) 235-1500. "Provides services to enable individuals with various disabilities of all ages to live as independently as possible within their homes and communities." Transportation. Facebook Group. A community partnership for special needs people of ALL abilities to provide social experiences through sport, recreation and life skills in North Brevard. To provide disability awareness through advocacy, education and leadership. "Serves all ages of individuals who have an Autism Spectrum disorder, and/or a sensory impairment (deaf-blind)." "Serving visually impaired individuals to foster independence and improve quality of life." "All ages, services to individuals with conditions that affect both eyes, including medical assistance, job placement, and counseling." Providing to support individuals with Autism Spectrum Disorders, their families and the professionals that assist them. Our goal is to give the residents of Brevard County the most comprehensive list of services avaliable for children with autism. Partnering with the APD, to bring quality services to individuals for dignity and choice. FEDS of Brevard is a non-profit organization that empowers individuals, provides peer support for families, enhance communities and celebrate the extraordinary lives of people with Down syndrome. FEDS has monthly parents dinners, provides funding for activities & services for persons with DS. Our annual events are the 3/21 Picnic, Beach Bash & Buddy Walk. We also have an active online support group for families/guardians. Folks I hate to do this. I can't even begin to apologize. Due to my ongoing medical issues I am canceling Archaeologists for Autism this year. Helping to unlock the potential of children with autism spectrum disorders. Raising awareness about the hurtfulness of the R-word. Join Us to End the Word. R-word is supported by Special Olympics and Best Buddies and over 200 other organizations from around the world. Educating and empowering individuals and families to optimize the potential of all individuals with autism and related disabilities. TRIAD's Project Lifesaver is a program designed to assist in the tracking and locating of persons with Alzheimer's and related mental dysfunction disorders, such as Down's Syndrome and Autism. PO Box 410518, Melbourne, Florida 32941-0518. Telephone: Call Brevard 2-1-1 at (321) 632-6688. A casual support group for parents and caregivers of children with special needs. Join us on the 2nd & 4th Friday mornings: 9:30-11:30 (pre-register for free childcare: 321-264-0855) at The Children's Center. For more information, please call us at 321-264-0855, or email us at�ChildrensCenter@ParrishMed.com. SOAK is a Non Profit organization that provides Support for parents, families and members of the community who are dealing with Autism and related disabilities. SOAK has monthly meetings, family events, awareness events and more. Also, we have an online support group which is very active and has been helping families with answers and guidance. 321-634-4464 / 321-626-8742 • Email • Website. Serves Brevard from Palm Bay. Palm Bay, Florida — ASK US Florida, Inc. hosts INCLUSIVE, stress-free outings for families with Autistic loved ones, in addition to an ANNUAL Autism Conference. Our mission is to ease the strains on those with Autistic loved ones by creating tailored and inclusive social events for members of the Autistic community, empowering and inspiring others, raising public awareness to foster advocacy, and providing support for those affected by the disorder." Phone: 321-802-1275, Email: info@askusflorida.com, Website: https://askusflorida.com, Facebook. The FOUNDATION provides people with Down syndrome and families opportunities to enhance their lives through strategic partnerships, unique programs that create 'inclusion' settings naturally, family support and meaningful community involvement. PO Box 533462, Orlando, FL 32853-3462 — info@dsfflorida.org – website – 407.538.3537. We strive to�provide quality,�individualized care to meet your goals and exceed your�expectations. Able Home Care, Inc.�works diligently with your family and your Waiver Support Coordinator�as a�team to provide the care you need and deserve. Heavenly Home Health Aid, Inc.
Home health agency specializing in providing exceptional and passionate care for developmentally disabled clients. "Case management and/or funding for children with special needs or mental health issues." Working with individuals with�some of the most challenging behaviors. Providing counseling services,�staff training,�and IEP consultations. 550 St. John Street, Cocoa, FL 32922. 321-639-9800. Provides and manages mental health treatment for special needs youth and their families. Educating parents about local resources, building community partnerships and creating social/recreation opportunities. Titusville Special Needs Care providers on care.com. Providing adult, adolescent and family counseling. With an appropriate atmosphere, clients achieve the personal growth they're striving for. North and Central Brevard, Volusia, and Flagler counties: 321-636-2692. No cost occupational and physical therapy to families who qualify. Please call with any questions you have. Statewide phone: 800-523-1673. Provides services to individuals with developmental disabilities and the elderly in the home and/or community based settings. We ensure to respect and honor all of your wishes. We provide the following services: Personal Supports, Companion, Respite, Supported Employment and Supported Living Coach. Florida Self-Advocates Network'D (FL SAND) is a statewide association of self-advocates led by self-advocates that exists to support advocacy efforts at the local, grassroots level. OUR MISSION: To ensure that people with disabilities are treated as equals and that they are given the same decisions, choices, rights, responsibilities, and chances to speak up to empower themselves; opportunities to make new friends, and to learn from their mistakes. "Provides services to children and adults with disabilities to lead independent lives." "Employment related services for youth and adults with disabilities and supported services." "Provides services to adults with disabilities to support skill development consistent with abilities and needs." Job seekers with intellectual disabilities, severe physical disabilities, or psychiatric disabilities may be eligible to apply for non-competitive appointment under the Schedule A authority. "Working age with a disability that affects the ability to work." Advocating and promoting meaningful, family-centered, supports for participation in all aspects of life for Floridians with developmental disabilities. "To advance the economic security of the nation's people through compassionate and vigilant leadership in shaping and managing America's Social Security programs." Providing financial assistance to people with disabilities who meet the criteria. Supplemental Security Income -- What is the U.S. Social Security Administration's Supplemental Security Income program? Social Security Disability Application Help -- Florida Residents Start Here for Benefits! The APD is an agency separate from the Department of Children and Families, specifically tasked with serving the needs of Floridians with developmental disabilities. The APD works in partnership with local communities and private providers to assist people who have developmental disabilities and their families. APD also provides assistance in identifying the needs of people with developmental disabilities for supports and services. ACCESS Florida: Food, Medical & Cash Assistance and Florida Abuse Hotline. The Department of Children & Families has several programs that can help Florida families. These include ACCESS Florida, Adult Services, Child Care, Abuse Hotline, Adoption, Adult Protective Services, Background Screening, Child Care, Child Welfare, Children's Legal Services, Community-Based Care, Deaf and Hard-of-Hearing, Domestic Violence, Foster Care, Homelessness, Human Trafficking, Independent Living Services, Interstate Compact for the Placement of Children, Mental Health, Public Benefits Integrity, Refugee Services and Substance Abuse. Children's Medical Services - Special services for children with special needs (birth to thirty-six months). A collection of programs for eligible children with special needs. 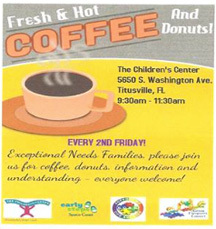 Every 2nd Friday at The Children's Center in Titusville we host a coffee and donuts gathering for families (with or without children). eMail Mary Cancel to be put on Brevard newsletter list. "Recreation and leisure opportunities for persons with disabilities throughout Brevard County." North Area: Andrea Chestnut (321) 264-5058 or (321) 264-5105. Central Area: Nancy Watkins at (321) 633-1874. South Area: Barbara Mitchell at (321) 302-1731. Education and engagement tools for teachers & students. While these are not specific to folks with special needs, many community activities are wonderful experiences for our people with their family or caregivers. An extensive listing with links to their sponsors and event details. Many local libraries, organizations & recreation sources publish calendars on their NBBD websites - do a search. Printable planners for visiting our many: Playgrounds, Refuge & Seashore highlights, Museums & History locations, Downtown & South Titusville destinations, Historical Markers. Includes Titusville Outdoors: Wildlife Watching, Fishing, Hiking, Canoeing and Kayaking. Last minute reminders of significant events in our area. Request that the newsletter be sent to the address on your eMail when you click above. Macaroni Kid North Brevard is a FREE weekly e-newsletter and website where you can read about activities and events going on in your local community and the area. "Our mission is to serve every student with excellence as the standard." Through interagency collaboration, enhance the quality of life for all individuals with disabilities in Brevard County. The Interagency Council of Brevard is coordinated by the Brevard Public Schools. They have compiled a directory of services for Individuals with disabilities and coordinate informative meetings. Due to reduced funding by the Agency for Persons with Disabilities, we will close our doors on May 31st after 19 years of serving the needs of families in Brevard. "Educational support services for parents and teachers of students with special needs." If you have a documented disability, please contact the Office for Students with Disabilities. This will ensure a fair test for you. N. Earl Jones Building (Bldg. 1), Rm. 115 (learning lab): 321-433-5017. A program in local high schools "Supporting students who have earned a special diploma as they transition to adult life with high expectations resulting in excellence for all." Help for young adults with Asperger's Syndrome, High-Functioning Autism, ADHD and others. 3692 North Wickham Road, Melbourne, FL 32935. 321-259-1900. We have an ADA workstation with a larger LCD monitor, ZoomText software providing various assistive functions, and an assistive mouse adapter. We have a Sorenson Video Relay Service "videophone" for the hearing disabled with monitor and webcam facilitating online video sessions using sign language. We have a Merlin "Enhanced Vision" LCD Desktop Electronic Magnifier and also a Kurzweil Reading Edge machine, both for the visually disabled. We also provide a variety of magnifiers and other handheld assistive devices that can be checked out. Titusville Public Library's NBBD website with monthly programs lists. Port St. John has an ADA workstation with ZoomText and an Optiplex 20/20 magnifier. We have a small collection of magnifiers and handheld assistive devices. We have a small collection of Talking Books digital and tape cartridges. For more information about this service contact Brevard County's Talking Books Library at 321-633-1810 or visit the website: https://www.brevardcounty.us/PublicLibraries/Learn/AccessServices. Port St. John Public Library's NBBD website with monthly programs lists. Here you will find information and resources to help you learn ASL and improve your signing. Our goal is to provide a much needed housing choice for family members with special needs. "Mission: To insure equal housing opportunity and eliminate discrimination in Florida." Find low income apartments in Titusville, Florida along with non profit organizations that help with low income housing needs. "Need A Ride" Transportation: We provide safe, door-to-door service in our wheelchair accessible vans for the Disabled of Brevard County. Trips for Medical, Legal, Grocery and Social Events are available Monday through Friday 8:00am - 4:30pm. Call for details: (321) 633-6011. Brevard County Emergency Management, 1746 Cear St., Rockledge, FL 32955; 321-637-6670. Providing emergency sheltering and transportation with the resources available in Brevard County. If you meet the Special Needs Shelter criteria and have no alternative for safe, staffed, emergency shelter, you must preregister. Q. Is Parrish Medical Center a special needs center? A. We work closely with the County, who coordinates placement into a special needs center. We will only receive patients who are already on the County's list. Individuals not currently registered with County, but requiring special needs during a time of emergency should contact the Brevard County Office of Emergency Management at 321-637-6670 for more information. Children's Medical Services Managed Care Plans - Managed Medical Assistance (MMA). "Primary and specialty medical care, early intervention and case management from birth to 21." Child Protection & Safety, Child & Family Information, Early Intervention / Child Development, Newborn Screening and more. Special needs adults may be eligible for family planning and maternity as would all adults. 611 North Singleton Avenue, Titusville, FL 32796 • 321-383-2795. • Titusville Florida Clinic webpage. Help accessing service like food stamps, medicaid. Fast Service: Your groceries are delivered the same day, in as little as an hour. Service by instacart which is not affiliated with Publix. Click for groceries delivered in 1 hour. Delivery in as soon as one hour from your local store, saving you time & energy. Shoppers hand-select items from your local Target, so you get the freshest picks & the exact products you ordered. Shipt is a same-day delivery service that shops for you. Phone your local store to find out when this service becomes available. Become a voice for children who need someone to speak for them in court. Law Syndrome affects 100% of people with Down syndrome. It's a series of antiquated laws that impede the pursuit of a career or living independently without risking Medicaid benefits. Help us fix the law and end #LawSyndrome. N.B. Parks & Recreation Programs for people with disabilities. Calendar of North Area Parks & Rec. activities for people with disabilities. To a North Brevard Special Olympics website. Click blue underlined text for details. For parents & caregivers of any & all special needs people. Descriptions of more than 60 attractions in North Brevard. Printable destination sheets.